I think I fell asleep within one minute of my head hitting the pillow after that first night. That couldn't really be the alarm clock going off at 5:15, could it? It was still dark as we made our way to Fisher House to prepare a pancake and sausage breakfast. PLW and I started cooking sausage at 6:30 and usually the soldier residents of Fisher House and their families start stirring around 8:00, but there are some who have children to get off to school, so we like to have a breakfast waiting for those early risers. But this morning, the smell of sausage brings them at a steady rate. This second day, they are getting used to seeing us in their world, and they smile and open up, talking to us about their injuries, how many surgeries they've had, and their rehab. The one thing I notice is that they all want to talk about what happened to them .... in detail. PLW, being another man, is quick to engage them and ask them about their injuries, where they were, and the circumstances of their traumatic wounds. When I voice their willingness to talk about their missing limbs, and the details of "The Day Their Lives Changed Forever", PLW is quick to tell me, "If you had made such a huge sacrifice for your country, you'd want someone to know about it and acknowledge it. You'd want it to count for something." 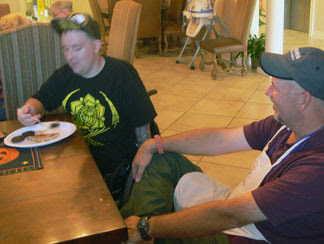 So we hear their stories: Dan lost his leg from an IED in Afghanistan; Richard was shot 3 times by the Taliban who entered his FOB in Afghan army uniforms; and there was Bo, who lost both legs and one arm to a roadside bomb. They don't shy away from showing us their scars, and telling us about their successes and setbacks. And to a man, they want to return to their unit. Period. They count the days between medical assessments, always keeping their eye on the prize: when they can be released and get back in the fight. You can see that longing in their eyes. But there are also personal stories of the wives that support their husbands through this traumatic time in their lives. One of the most moving episodes this day involved Lauren, one of our Angel Chef volunteers, who had just arrived and struck up a conversation with a young girl who was going to be getting married this next weekend. It was going to be a quickly arranged wedding on post, as her fiance was getting deployed. 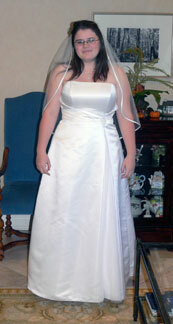 She didn't have time to get a dress or plan a proper wedding, let alone afford it on such short notice. So Lauren, (in the true spirit of all of us who love this military family at Fort Sam) took this young bride out today and shopped at David's Bridal for a wedding dress. Most of us were unaware of her story until she came in to the Fisher House beaming and saying she had experienced the most wonderful day of her life. She was carrying her dress, and it didn't take much coaxing to talk her into modeling the dress for us. We all told her how beautiful she looked and congratulated her on her wedding. Her smile said it all! But it's not only the injured soldiers, and the women who love them that capture my heart. It's their children. 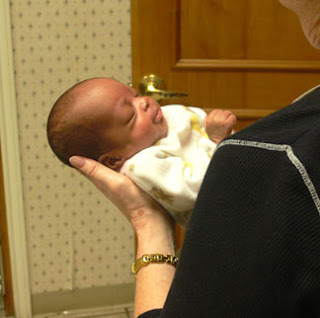 There are the preemie babies born to women soldiers, and the precious 3-month old that was airlifted from Korea where his parents were stationed because he is suffering from epilepsy. It's nice to know they are returned to the States for the best medical care available. But the older children are heroes, too. They are supportive of their dads, and adapt to a disrupted family routine, never complaining. I have to share the story of two precious little girls that make their dad, Dan, very proud. They were sharing dinner with PLW and their dad at one table, while I was talking to another young family. Before I knew it, Gracie and Kaylee were coming over to my table to discuss what colors I wanted my paracord bracelet to be. I soon discovered that they made these beautiful bracelets and charged $5 apiece for them .... $1.00 for the cost of the paracord, and the other $4 they donate back to the Fisher House Foundation. Of course, PLW bought several bracelets to support their charitable enterprise. Even the children of wounded warriors know the meaning of sacrifice! So, as I contemplate tomorrow, which is our last day of service to these heroes, I am already getting emotional about leaving them. I want to just adopt everyone of them, and I want to know that they will all be OK and reach their personal goals. PLW and I have already let it be known that we want to return in December for the Christmas trip. There will be no better time to celebrate the gift of freedom that they make possible for all of us. The best way I can share my day with you is to display it in photos. I hope they give you a sense of what a blessing my time here at Fisher House has been. The new bride was so happy to show us her dress! 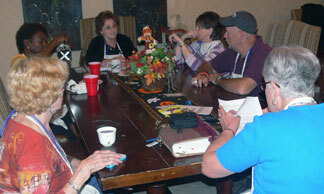 Our devotion time where we discuss those we need to pray for. 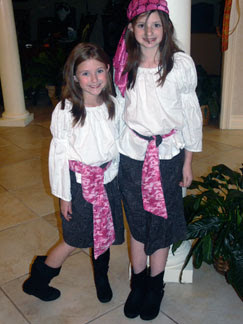 Kaylee (left) and Gracie dressed as pirates. They were leaving for a Halloween party at the Family Center on Post. Beautiful baby that we all loved on! We couldn't resist her! Ephesians 4:15-16 "Instead, speaking the truth in love, we will grow to become in every respect the mature body of him who is the head, that is, Christ. From him the whole body, joined and held together by every supporting ligament, grows and builds itself up in love, as each part does its work."